Katharine White began working at The New Yorker in 1925, the year of its founding, and was an editor there for thirty-four years, shaping the careers of such writers as John O’Hara, Vladimir Nabokov, and Jean Stafford. Throughout and beyond those years she was also a gardener. In 1958, when her job as editor was coming to a close, White wrote the first of a series of fourteen garden pieces that appeared in The New Yorker over the next twelve years. The poet Marianne Moore originally persuaded White that these pieces would make a fine book, but it wasn’t until after her death in 1977 that her husband, E. B. White, assembled them into this now classic collection. Whether White is discussing her favorite garden catalogs, her disdain for oversized flower hybrids, or the long rich history of gardening, she never fails to delight readers with her humor, lively criticism, and beautiful prose. But to think of Katharine White simply as a gardener, cautioned E. B. White in his introduction to the book, would be like insisting that Ben Franklin was simply a printer. 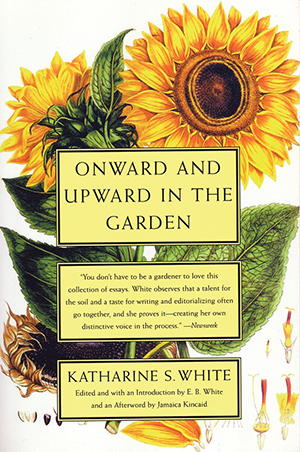 Katharine White had vast and varied interests in addition to gardening and she brought them all to bear in the writing of these remarkable essays. Onward and Upward in the Garden is an essential book of enduring appeal for writers and gardeners in every generation. Intensely personal and charged with emotion, the essays remain timeless. Now in this new edition, White can be read and appreciated anew.